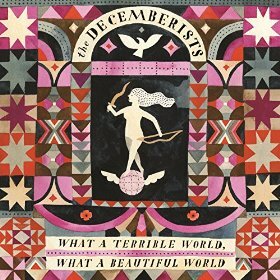 There are some notably different flavors in The Decemberists’ new album, What A Terrible World, What A Beautiful World, including more grounded and mature themes and lyrics and a more mellow, sometimes serious, folk sound. The evolution of the band is evident on songs like “12/17/12,” which was inspired by the tragic Newtown school shootings and melodic, sentimental “Lake Song,” which both illustrates a familiar sense of melancholy and reflection. The album is an easy listen and has a number of beautiful, soulful songs that fans should love, such as the moody and cinematic “Carolina Low” and the pop-friendly “Make You Better.” The band has now been around for fifteen years so it makes sense that their seventh studio album shows growth even if fans mourn the loss of the bright and playful earlier work, but the connective tissue persists on songs like the bright “Philomena,” which has a 1950’s throwback feel. The band worked once again with producer Tucker Martine on the 14 tracks, which feel more focused and a bit less orchestral than previous songs. The regal album art from Carson Ellis gives a good inclination of the spirit of the songs that range from somber to sanguine, both with a sense of depth and wisdom that come only with years.